You can find the rest of the press release below. I thought I would give them a month or so to get the search engine up and running and also see how well it updates with new pages, given their self-proclaimed USP is the 160 billion pages indexed (which is more than Google, apparently). This week I gave it a brief trial, the 'first impression test' to see if it is a serious contender. 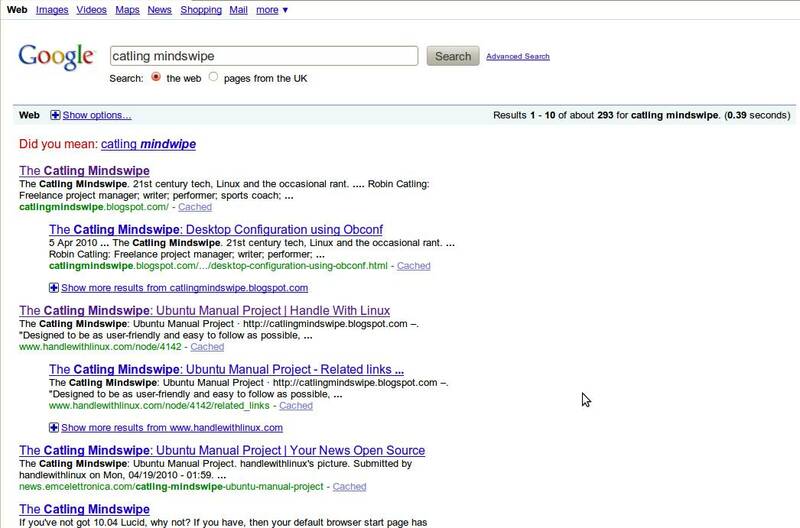 I entered 'catling mindswipe' (I know, I know, vanity) in both Timmp and Google using separate tabs in my current Firefox install. Query Screen: very minimalist and stripped down. No extra fills, links or advertising, just Timmp's own rather slick branding. There's no localisation option and no advanced option. Performance: results came back very quickly for a busy weekday. I just have no idea how many results it returned. Results Screen: This is where I have most issues. As an old print-industry fogey, I like white space. White space is good and there's plenty of it to break up the text. However there's here's a big chunk of wasted real estate under the search entry box for no discernable reason. Not sure I want to use this on the JVC Mini-note with its 1024x600 screen. There's no count of items in the result set. How well am I searching? I have no idea. I get a menu sidebar with jump links for Web results (isn't that what I'm on?) and top of page (ok, useful). Feedback - which doesn't work, complete blank screen. Disable Safemode - I didn't even know I was in 'safe mode'. And there's no explanation available to tell me what safe mode is - no tooltip, no help, nothing. It's an on/off toggle option. Results - presented clearly with a linked title, some summary text and the plain-English page url. This works adequately. Result Set - this is the crucial thing. Timmp gave me more-or-less the same first three pages of results as Google, albeit in a slightly different order of relevance. Unlike some search engines I could mention. I also spotted a discrepancy in the timeliness of some results - Timmp missed some of our newer pages and references to our site in other blogs and aggregators. Google is pretty well current to within 2 days. LONDON, April 1, 2010 /PRNewswire/ -- Step aside Google as from tomorrow there's a new kid on the block in the world of search engines. The much awaited Timmp.com search engine will officially launch today and will offer users the ability to find information from over 130 billion indexed web pages. This staggering resource means it is even larger in size than Google and an unrivaled new source of research. Timmp is unique and will make it much easier for users to research material on any subject or topic. The project has been backed by a number of entrepreneurial moguls and is a joint development between the UK-based LeBeuf Developments, a US technology company and AZ Media, a Netherlands based communications and New Technology company. A spokesman for Timmp said; "Timmp makes the online user experience simpler than ever before, the ability for research within split seconds is simple yet effective, and our partnerships with leading companies in our field has allowed us synergy to do this more effectively." Yahoo will be providing Timmp with the technology to display results and the company's contract with Google will allow the new search engine to display sponsored adverts relevant to the search topic being entered. Plans are already under way for Timmp to launch a user interface, as well as introducing new features such as the ability to take notes whilst searching, real-time searches with Facebook and Twitter. Timmp is also in advanced contractual stages to be able to incorporate YouTube technology and further breakthrough. With so much on offer Timmp is sure to become one of the most important new search engines available. Perform the same search on timmp.com and then on yebol.com and you get the exact same results, but formatted slightly differently. It looks like timmp.com is using yebol.com's api (http://yebol.com/yebol_apis.htm). I read many comments and reviews about this. One thing i noticed is that timmp has done a great job on buzz marketing (congrats). From my experience when there is so much buzz about a website or service it turns out to be rather disappointing. During my research i ended up at webmaster.al (albanian webmasters i am guessing). even though i could not understand what was written i found a link that pointed to a "anti-criticism" note from the owner of Timmp on how the Albanians (everyone really) is criticizing his project because he is from Albania. If it was that the reason off all this than why isn't biibu under fire (Biibu is SN web- soon to go live), simple the owner of biibu (which i believe is also from Albania) has set realistic goals. What i want to say that this buzz marketing about beating Google has gotten him a couple thousands clicks but has hurt him in the long run. And no he is not getting criticized because he is Albanian (why would that matter??) but because that his site does not back his allegations. Timmp's press releases are all dated April 1st? I carried out some contract work for Marcel Gashi or Marcel Lebeuf (he seems to go by both) and he never paid and he seems to have vanished from the earth. I think the whole website is a scam. Yes, we did some work for Marcel and also did not get paid - warning to anyone thinking of working with this guy in the future - insist on money up front. He is a con man. Hi there, I also work for marcel ghasi...he is a big scam. He told me he is owner of company and signed void/fake contract being a student i did not know that i was signing a fake contract.He told me investors will invest if you do some code on web ...i did but neither he got investment and nor he paid me. Website is scam ...all developers specially students be aware. I am detecting a pattern emerging here. Whilst I am not privvy to the workings of Timmp or Mr Marcel, it seems that Timmp is not exactly setting the world alight and Marcel is hardly the next Bill Gates.